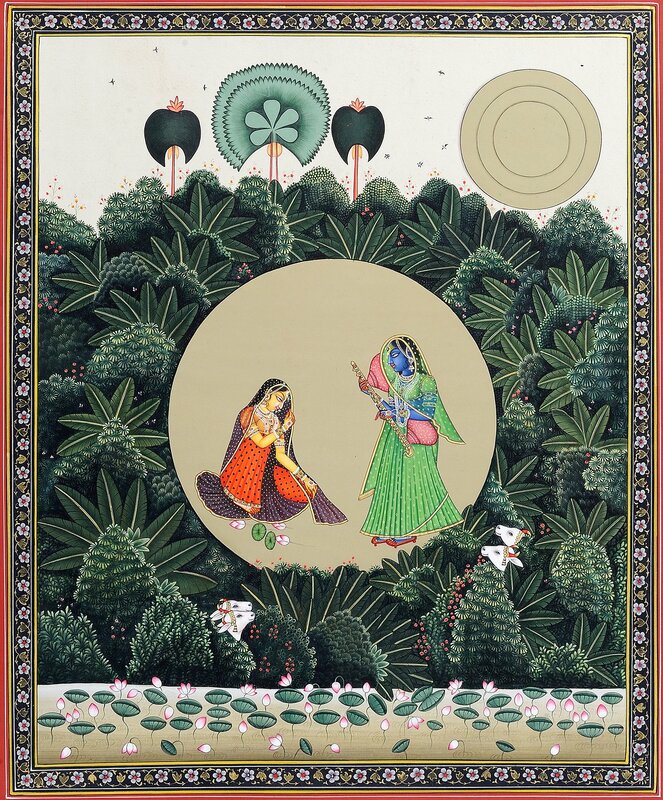 Rendered in Marwar idiom of Rajasthani art style, pursuing the theme, style and everything of an early nineteenth century miniature from Jodhpur, in its exactness except the painting’s size and the background colour of the circle in the centre containing the figures of Radha and Krishna, the painting portrays a grieving Radha for Krishna’s failure to reach there despite the promise he had made her, and Krishna disguised as a Gopi standing before her. Radha had brought with her lotuses for Krishna but the same now lie on the ground. She is unable to raise her head and dispel her disappointment which further aggravates when she thinks how for him she had adorned herself like a bride and had come so far in the night. The full large moon and the colourful nature around make her more miserable. The night is advancing and she does not know if he would join her or she shall have to pass the night in this grove of trees all alone save a few compassionate cows as eagerly awaiting Krishna’s arrival. Krishna, mischievous as he is particularly when inventing ways for teasing Radha, is already standing before her but disguised as a Gopi and, as he had pre-meditated, Radha fails to recognise him not only because he is in a Gopi’s guise or has his face covered with the sari’s end, but also because with her bent head she is able to see only his feet and the sari worn around his legs. As if all this is not enough, for further beguiling her Krishna alternates his peacock feather-crest with an elaborate ‘benda’ – a forehead ornament, and instead of his usual flute carries a vina – a stringed instrument, like Todi Ragini manifesting the mood of separation in love. Except his blue body colour he has merged his identity completely with the Gopi’s. Maybe, Krishna struck the strings of his lyre but Radha, lost in his thought, might not have heard it at all, and this might have inspired Krishna to tease her more and more. Allegorically, Krishna as Gopi, that is, one as Radha – the soul in devotion, herself, asserts that a heart would find Him like itself if it truly merges in Him. Obviously, it was after the Bhagavata Purana and the Jaideva’s Gita-Govinda discovered dimensions of Krishna’s divinity in his love’s sport, there developed a huge body of myths that sublimated not only Krishna’s fondness for Radha, or Radha’s passionate yearnings for him but also many lighter aspects of life, the essence of Krishna’s Vaishnavism that accepted the life as it is and discovered its divinity in its sublimation. The great masters like Vallabha and Chaitanya added to such narrative and poetic dimensions of the Bhagavata and the Gita Govinda philosophical perspective and devotional cult and elevated them to the status of God’s divine sport with Krishna manifesting Him, and Radha being its timeless medium. When the fanatic Mughal rule of the later days sought to trample Vaishnava icons under its boots and the institution of Vaishnavism was in great peril, Rajasthan emerged as the timeless sanctuary of Krishna’s worship cult and there emerged not only a huge body of art portraying Vaishnava myths but also numerous shrines.